Hong Kong, a special administrative region of the People’s Republic of China in Eastern Asia bordered by the South China Sea, and China has a total land area of 426 square miles and a population of over 7 million. Hong Kong, one of the most densely populated places of the world, is described as where the “East meets West”. It has a very modernized way of life with traditional Chinese practices. Due to its limited land area the city has grown vertically and is able to offer recreational and competitive sport opportunities to its citizens. It is ranked highly for economic freedom, quality of life, highly developed transportation network etc. Hong Kong is rated laissez-faire capitalism where the government has a hands-off role in the economy, with little industrial policy and almost no import or export controls. October through December are the best time to visit Hong Kong. 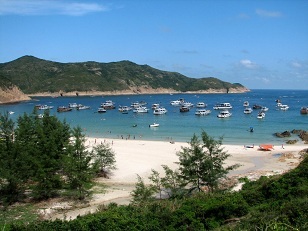 With its expansive skyline and a deep harbor Hong Kong has its share of attractions. Victoria Peak, Tsim Sha Tsui Waterfront, Stanley, Central District and Repulse Bay are a few among them. Hong Kong's cuisine is also a fusion of east and west where dim sum, hot pot, and fast food restaurants coexist in harmony with haute cuisine. Lonely Planet Hong Kong and Macau 978-1741792256 $15 Covers Guangzhou. Has Chinese characters in map keys making navigation easy. Over 300 pages covering Hong Kong and around 50 pages for Macau. Good info on hiking trails. Hong Kong Insight Fleximap 978-9812583727 $9 Laminated. 1:16,500 scale. Recommended Sights. The first stamps of Hong Kong were a set of seven stamps released on December 8, 1862 in The Queen Victoria (QV) theme. The set (Scott #1 to #7) is very rare. Each stamp in the set catalog for between $500 and $4000 Mint and between $60 and $500 Used. The same design was reused in another set of seventeen stamps released between 1863 and 1880. That set is also very rare and the 96c blister (Scott #23) is the most sought after Hong Kong stamp cataloging for close to $50K Mint. Another extremely rare issue is the 1874 issue in the same theme (Scott #25) which catalog for around $14K Mint. The QV theme continued in a different design in 1874 with the release of a set of three stamps. That was a high-value set with denominations ranging from $2 to $10. That set (Scott #26 to #28) is also very rare with the highest value cataloging in the $8K range Mint. Surcharge overprints and certain other varieties formed the stamp issues of Hong Kong until the turn of the century. Following the Chinese defeat in the Opium Wars (1839 and 1860), the territory of Hong Kong including the Kowloon Peninsula and Stonecutter’s Island was ceded to Britain. In 1898, the Convention for the Extension of Hong Kong Territory established a 99-year lease of Lantau Island and the adjacent northern lands. Hong Kong released a set of fifteen stamps in 1903 in the King Edward VII theme. That set (Scott #71 to #85) along with a long running (1904 to 1911) set (Scott #86 to #108) are both expensive cataloging in the $3K range for Mint and $2K range for Used. Certain King George V (KGV) key types followed in 1914 and those along with some common design types were the primary stamp issues of Hong Kong till 1938. A long running King George VI (KGVI) theme appeared in 1938 and continued through 1946. In the interim a revenue stamp with a 5c numeric design was officially authorized to be used for postal purpose. That stamp (Scott #167) catalog for around $80 MNH and around $20 Used on cover. A set of six stamps released on February 26, 1941 to mark the centenary of British rule. The set (Scott #168 to #173) catalogs for around $100 MNH and around $20 Used. The designs show KGVI head portrait along with the following central design themes: Street Scene, Hong Kong Bank, Liner and Junk, University of Hong Kong, Harbor, and China Clipper and Seaplane. Hong Kong was a free British trading port at the time. The territory was invaded by Japan on 8th December 1941. United Kingdom resumed control of the territory after the war in 1945. A stamp released on March 30, 1967 to mark the completion of the Hong Kong-Malaysia link of the South East Asia Commonwealth Cable, SEACOM. The stamp (Scott #236) catalogs for around $20 MNH and around $5 Used. The design shows an Outline of Telephone with Map of South East Asia and Australia. SEACOM is a telephone cable that linked Hong Kong with Malaysia and Northeastern Australia through undersea cable. Another stamp in the technological progress theme was the Radar, Globe, and Satellite issue of September 24, 1969 to mark the opening of the satellite earth station on Stanley Peninsula, Hong Kong. The stamp (Scott #252) catalogs for around $25 MNH and $5 Used. A set of four stamps released on March 14, 1983 showing Hong Kong Views by Night theme. The set (Scott #415 to #418) catalogs for around $25 MNH and $10 Used. The designs show Victoria Harbor, Space Museum, Chinese New Year Fireworks, and Jumbo Restaurant. There are over 7,500 skyscrapers in the Hong Kong skyline that puts the city at the top of world rankings. A set of four stamps released on January 23, 1990 to mark the Lunar New Year (Year of the Horse). The set (Scott #560 to #563) catalogs for around $10 MNH and $7 Used. Hong Kong has released stamps for every Lunar New Year from 1967 onwards. The theme is pretty collectible. The first coin of Hong Kong was a British Colonial Bronze Mil issued in 1863. The issue has very high mintage (19M) but still catalogs for over $100 UNC and $400 for the Proof. The variety issued in 1864 is rare and catalogs well into the 1000s. Special Administration Region (S.A.R.) Decimal Coinage started in 1997 with the issue of a 10 cent Brass Plated Steel Coin. The design shows Bauhinia Flower in Obverse and Sailing Junk in Reverse. The issue is common and catalogs for less than a dollar in BU. Hong Kong has issued gold coins from 1975, the most collectible of which is a set of One Thousand Dollar Gold Coins and Proofs released between 1976 and 1987 themed on the Chinese Lunar Calendar. Coins $1 and up Common UNCs start around $1. Silver Coins from the 19th century in XF start around $10. 1997 Colored Euro Dragons starts around $75. Holed Mils from the mid-nineteenth century, Trade Dollars from the late nineteenth century in UNC, etc starts around $100. Gold coins go well into the 100s. Lunar Year Proof sets go well into the 1000s. Paper Money $1 and up Common UNCs starts around $1. High Values from the 60s and 70s in UNC starts around $20. ZZ Replacements in UNC, Rare Dates, Low Numbers, etc starts around $75. Bundles and Early Large Notes go into the 100s. Uncut 1997 QE issues, Rare Specimens from the 1970s, etc go into the 1000s. It is a cinch that almost all who visit Hong Kong will splurge in either a well-tailored suit or some sort of an electronic gadget. Tea, spices, and china are other items visitors tend to buy. Art $15 and up Small enamel vases and decorative bowls start around $15. Vintage hurricane glass metal lanterns start around $30. 18th century maps, opium merchant original documents, etc start in the 100s. Antiques $5 and up Recent posters, canvas print post art etc start around $5. Vintage British travel posters start around $25. Original paintings from artists such as Alexander Chen, Thomas Mak Kon Kln, Marcel Mouly, Chan Kau On, etc start in the 100s and go into the 1000s.